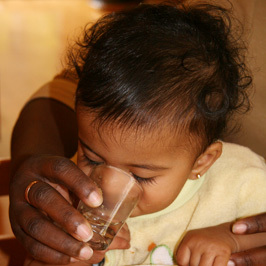 As soon as your child can hold something in his two hands introduce a small glass for drinking. When we offer him a glass instead of a bottle or ‘sippy’ cup he feels he is being like a ‘grown up’. Putting this trust in your child makes him feel good about himself. 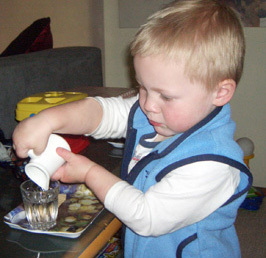 Also provide a small jug, which has a weight and handle in proportion to his size so that he can pour his own drink. Using slow deliberate movements demonstrate how he can grasp the glass with two hands and bring it to his lips to drink. Once he can do this you can also show him how to pour his own drink from a small jug with a small amount of juice, water or milk in it. 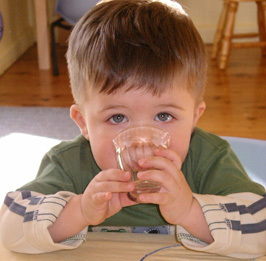 At first your child will dribble the water down his chin and will spill when he pours from the jug. This is natural when he is learning a new skill. Bearing in mind that we learn more from our mistakes than our successes will help you to keep a positive approach as your child learns to drink by himself. Place only a small amount of water in the jug. Lift the jug with one hand on the handle and the other hand under the lip. Centre the lip over the centre of the glass and pour slowly. Pick up the drinking glass with two hands and take a drink. When carrying the jug and glass to the table, make two trips and show how to carry each object with two hands.